NASA’s Science Mission Directorate (SMD) periodically conducts independent, comparative reviews of its operating missions. NASA uses the findings from these reviews to define an implementation strategy and give programmatic direction to the missions and projects concerned for the next five fiscal years. These reviews of operating missions are NASA’s highest form of peer review, as the subject is not a single science investigation, or even a single space mission, but rather a portfolio of operating missions. The reviews of operating missions are referred to as Senior Reviews, in recognition of the high level of the peer review. 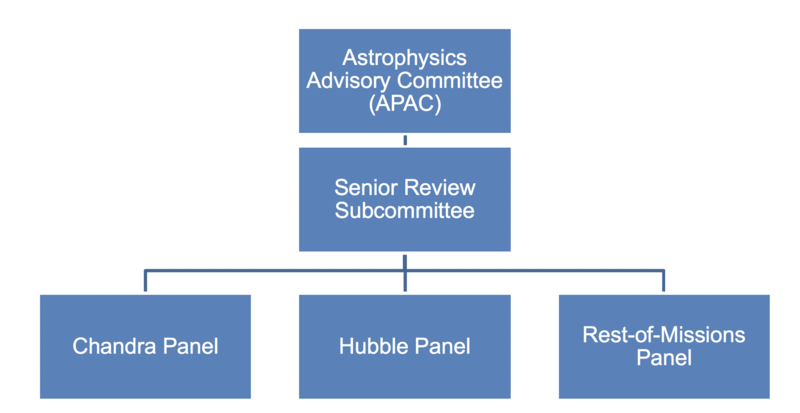 The 2019 Astrophysics Senior will adopt a multi-level review structure (see figure below), in which three panels report to a Senior Review Subcommittee, which has been established as a subordinate group to the Astrophysics Advisory Committee, consistent with the Charter of the Astrophysics Advisory Committee and compliant with the Federal Advisory Committee Act (FACA) of 1972 (P.L. 92-463). Please see the Terms of Reference for the Senior Review Subcommittee for more information. The Call for Proposals contains detailed instructions for proposal submission along with charges to the panels and Senior Review Subcommittee. For information about prior Senior Reviews, please visit the Astrophysics Documents page.